This is a fall-themed meal I have really enjoyed making lately. The farmer’s market always boasts squash in all shapes and sizes and little by little I am discovering how each tastes. My absolute favorite way to make them is to roast them. I love pairing squash with herbs and nuts and was delighted to find this hazelnut sage pesto recipe to go with my butternut squash. I looked up at my top shelf one day and saw La Chamba that Ean and I had brought back from Colombia. We had bought 13 different pots but only two had made it without smashing in millions of pieces. I don’t cook with it often enough so I thought of what fall-themed meal I could make. 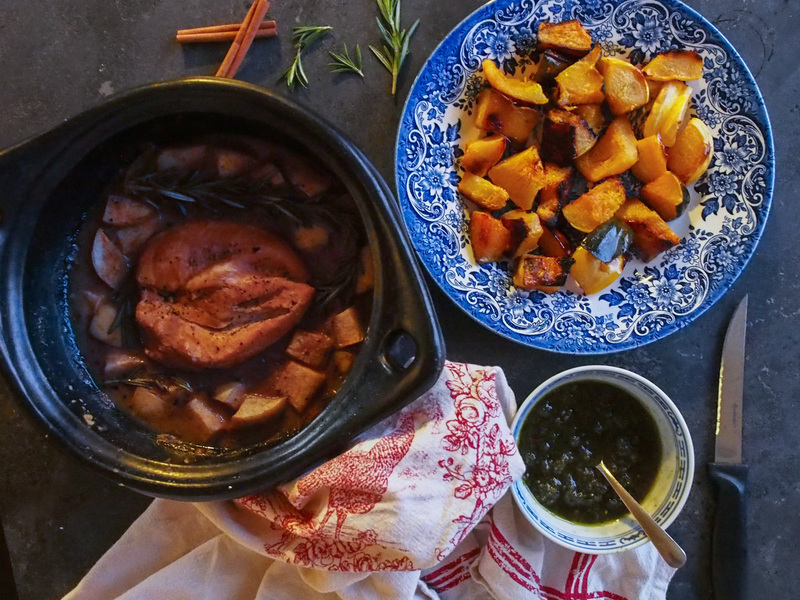 Apple cider braised chicken! I had hoped to get a weekend of apple picking in Oak Glen this year but the weather was never in our favor so we skipped it all together. But nothing was stopping me from making my own version of apple cider! I have never cooked with it and thought it could add some flavor to the chicken. Thirty minutes before cooking, put your chicken breasts in salted water. This will prevent your chicken from being to dry later. For my baking dish, I used la chamba. It is a sort of casserole/baking dish made out of clay that I brought back from Colombia. It goes in the oven, on top of the stove and onto your hot plate when ready to be served. Any 1 quart baking dish with a lid will do. Heat up the butter and olive oil over low heat. On a separate plate, season the chicken breasts with salt and pepper on both sides then place them into the dish. Cook chicken until skin is golden, about 5 minutes. Flip the chicken breast and cook until that side is golden as well. Remove chicken breasts and set aside on a plate. Add garlic to the pan and cook on low heat until lightly brown, a minute or two. Add the flour and cook for one more minute. Keep scraping the garlic with a wooden spoon so it does not stick to the bottom and burn. Pour in the apple cider vinegar and stir quickly with your wooden spoon. Immediately add the spices, chicken stock, apple juice and pieces of apples. Bring to a boil, then reduce heat to low. Add the chicken breasts back to the pan and add the rosemary springs. Cover dish and simmer for 30 minutes. Start roasting the butternut squash (see below). Remove cover from pan, flip the chicken breasts and continue to simmer another 30 minutes. Preheat the oven to 500 ° F (260 ° C). Prepare a baking sheet lined with parchment paper. Place the oven rack on the lowest level of the oven. Peel the butternut squash, cut it in half lengthwise and remove the seeds. Cut each squash half in cubes with sides of about 1 inch. Place them in a bowl and toss the olive oil, sugar, salt and cayenne on top. Mix well so that the squash is well coated. Place squash cubes on baking sheet. Roast for 10 to 15 minutes (you can start working on the pesto) then flip them over and roast for another 15 minutes. In a small pot, heat up 3 tablespoons of olive oil, the sage and minced garlic over very low heats. Pour into a mini food processor. Toast the hazelnuts. Place them into the food processor as well and mix well. Add salt to taste and the last 2 tablespoons of olive oil if needed. The pesto will be nutty. Serve apple cider chicken with a side of roasted butternut squash. Cover squash with a little bit of pesto.